The Tower Home was conceived as a new single-family residence on a steeply sloping, wooded hillside near downtown Martinez. 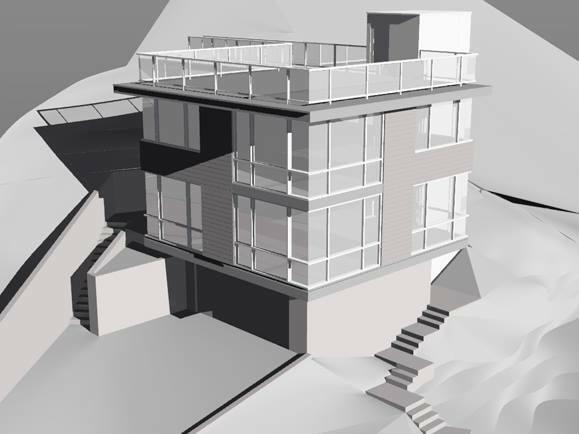 The topography of the site mandated a site-sensitive design approach that was unique to the specific challenges of the property and the program of the client. The design minimizes the building footprint by arranging living spaces in a vertical rather than a horizontal format. Levels are connected on the north side by a vertical circulation core, and the large roof deck is grounded to the hillside by a thin steel bridge that provides access to a hidden garden hot tub, nestled in the sloping terrain. Passive energy conservation systems inform the aesthetic nature of the project, including large expanses of glazing due south and east that allow the concrete finish floor on the first level to store latent solar gain during winter months. Summer cooling is promoted by operable windows that are positioned to take advantage of prevailing summer breezes and the stair tower uses the stack effect to exhaust hot air during cool summer nights. Natural cedar siding is used on opaque wall surfaces and is complemented by the medium bronze color of the window mullions and various fascia panels. While the expansive window walls of the home reference the cool flat waters of the Bay, the exposed concrete at the building's base and the galvanized steel guardrails on the upper level pay homage to the Bay Area's foggy gray microclimate.